Tone on Tone - Interior & Garden Design: Around the Garden and a New Shipment! For me, a garden is incomplete without the following: year-round structure and good bones; pretty flowers and interesting foliage; and furnishings and ornaments such as urns, sundials, birdbaths, statues, etc. 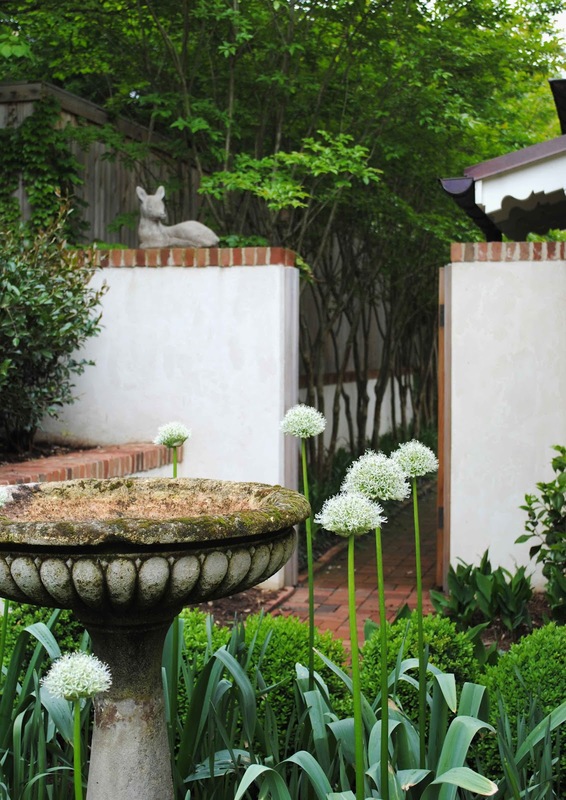 Whether used as a focal point or backdrop, garden ornaments can create interest, drama and / or whimsy. Used in formal settings, they can be stately. 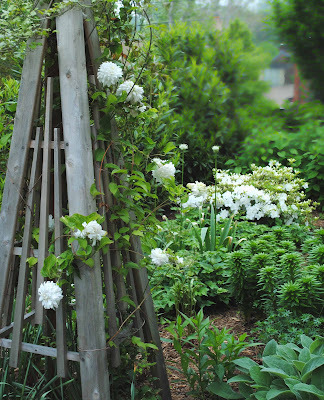 While in cottage gardens, they provide structure amongst the loose plantings. And, what would a gracious garden be without some form of seating? The boxwood are doing well this year. We planted all 48 of them 3 years ago. The sundial garden with a Luytens style bench in dappled shade. The Mt. Everest alliums are super tall this year! Please stop growing or you will dwarf the birdbath! 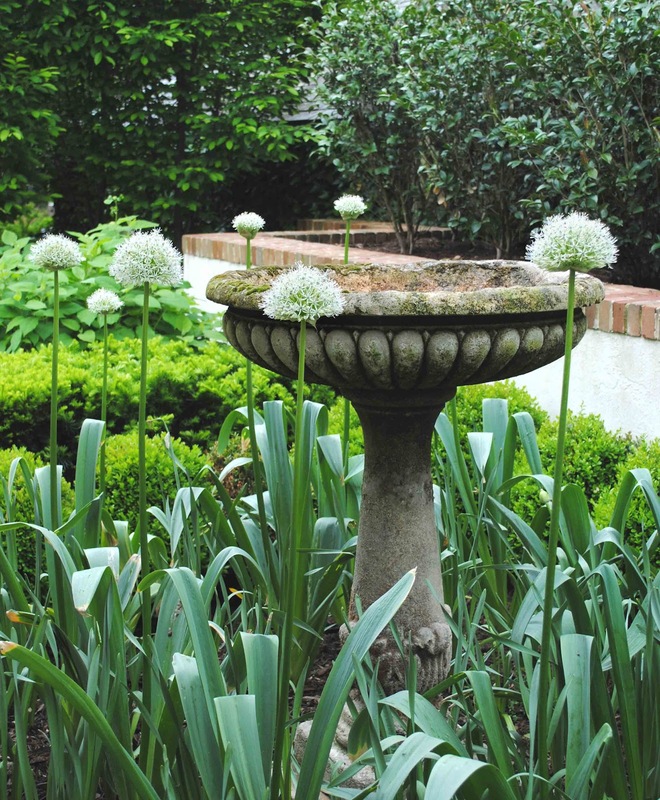 In the white border garden, this footed urn on pedestal serves as a focal point. 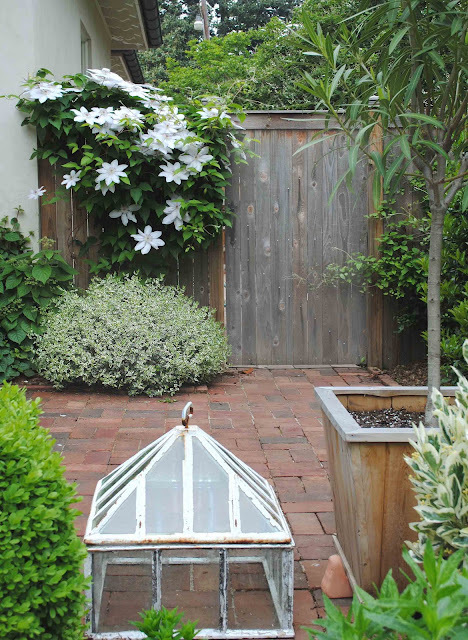 An iron & glass cloche for protecting tender annuals. This lavender tinged clematis (I forgot her name) turns a pure white. 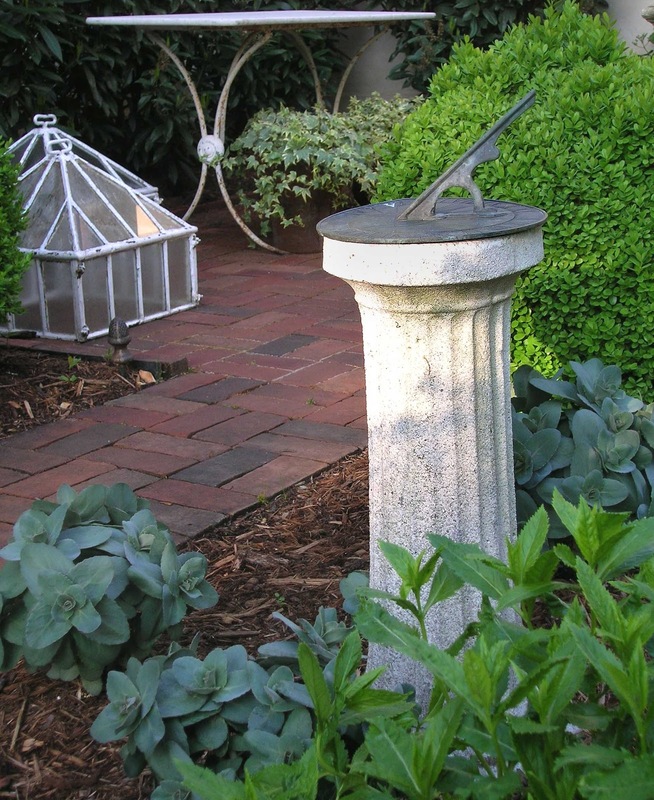 The small granite sundial in the white garden. A weathered tuteur with "Duchess of Edinburgh" Clematis, an old fashioned double. Hi, Panda! Don't you dare pee on those boxwood!! From the new shipment, a fantastic tall & shallow French painted cabinet with cubbyholes inside. 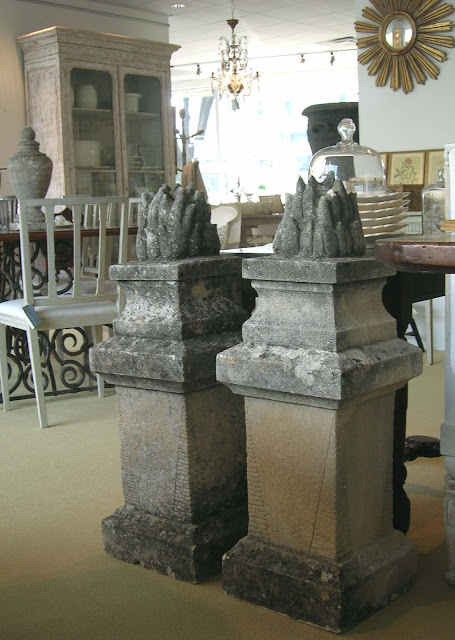 From Bordeaux we have a pair of carved limestone flame top finials. A pair of English Luytens style weathered garden benches, pair of French terra-cotta chimney pots & much more. 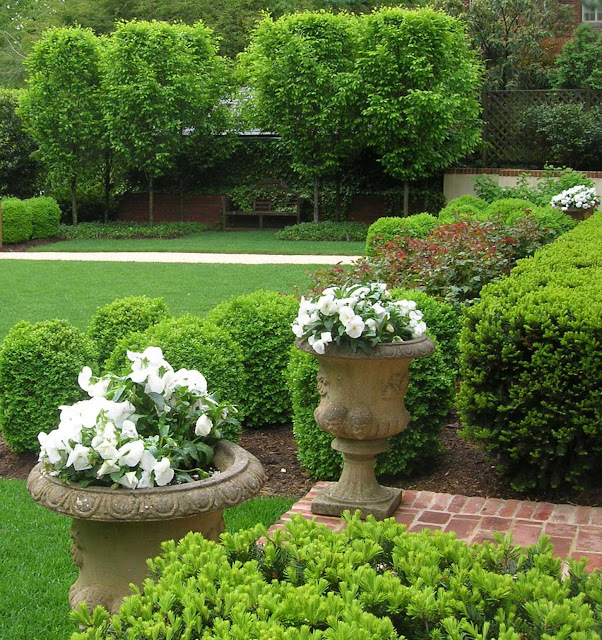 Hi Loi - Your garden looks beautiful with the trees leafed out and the boxwoods in their glory! Did you use DG or gravel for your front walkway? And how wide is the walkway? It has a nice substantial width so two can walk side by side comfortable. Thanks for sharing. Loi, the gardens are exquisite. The clematis are incredible and I love the silvery green of the bedding plants along the walkways. Just beautiful. Now for your newest finds in the shop....absolutely gorgeous! What a beautiful spot to land! Your garden has taken my breath away. It is truly stunning. I love everything about it. I would love to pick it up and put it down in situ here! I think we must have similar tastes in our gardens. If ever I get to Washington, your shop would definitely be on my list of things to do. What beautiful inspiration to carry around in my little brain today! As for your new stock... well, I could easily find homes for everything. Your garden is beautiful. It looks like a wonderful place to be. I love the flame top finials, so unexpected. Your gardens are so...inspiring Loi! I love the tranquility that you have created with you plant choices and garden elements! So peaceful and elegant! As for the new shipment of wares...divine! So many amazing treasures! Hope you enjoyed you day off! 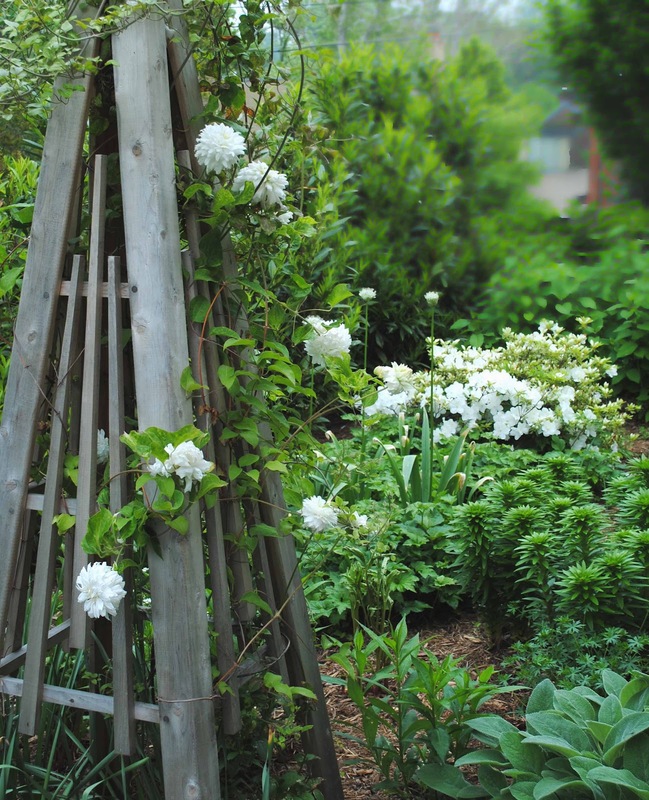 Love your garden, Loi, and the fact that it is mostly green and white. So restful. The garden looks very mature (every gardener's goal), but I thought I read on your blog that you had not been in this house for too long. Job very well done! Love the tuteur. If you hadn't mentioned the name of it I probably would have referred to it as the 'wooden teepee thingy'. For me the last photo of your shop looks like an adult candy store to me. Love everything in that photo. Can't wait to see your garden in full bloom. Have a wonderful weekend Loi! Loi, your garden is so serene. A perfect green garden with touches of white - very Sissinghurst! 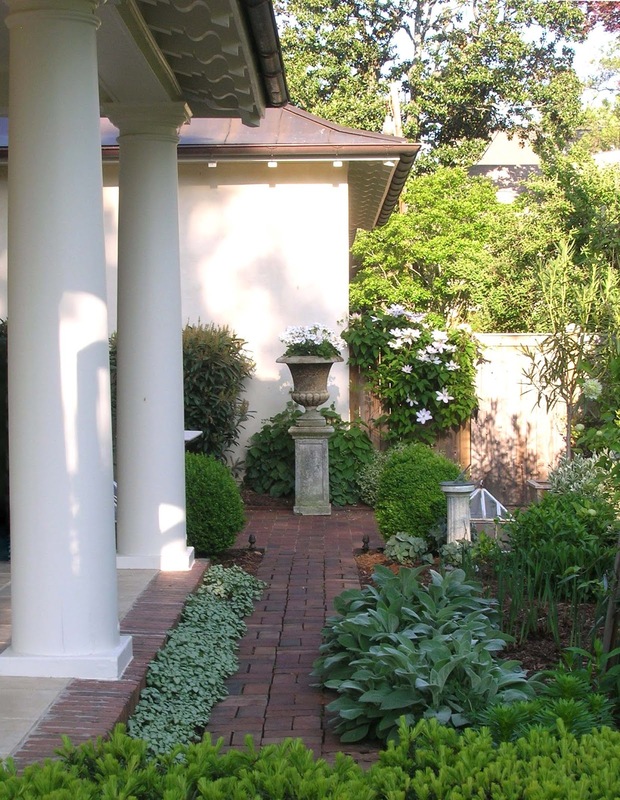 Agree, gardens need structure and focal points - you have some beauties! 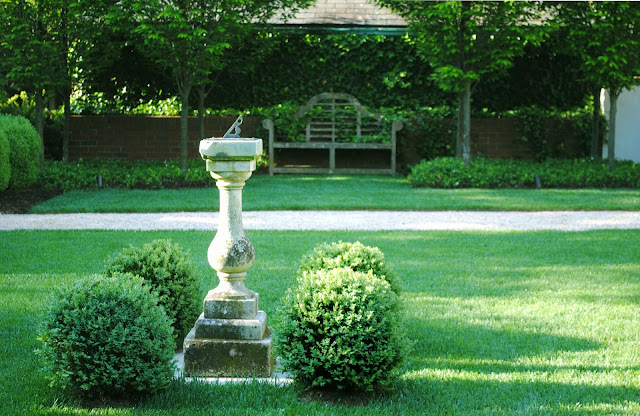 they look so well, so aged - they compliment your garden design perfectly. The garden looks so green and lush it could be here in Ireland! That first Clematis is stunning the blooms are huge! It looks so happy where it is - I'd love to know the name! 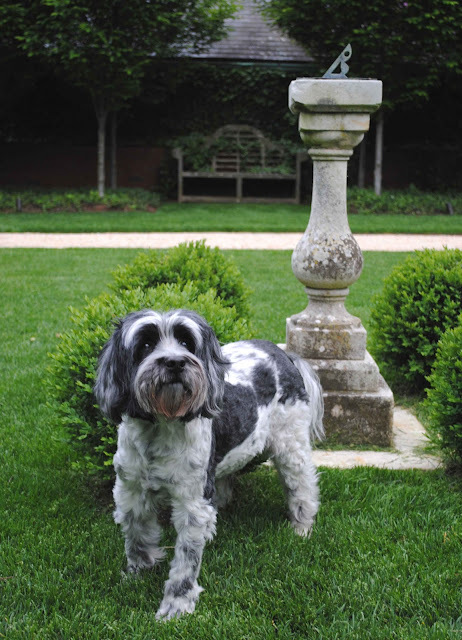 Also, Panda is sooo cute but what is it with dogs and boxwood?? my dog won't pee on anything else except my lovely pyramids!! As for your shop - I could eat it!! You must be so excited getting your shipments, unpacking all that beauty! sigh! 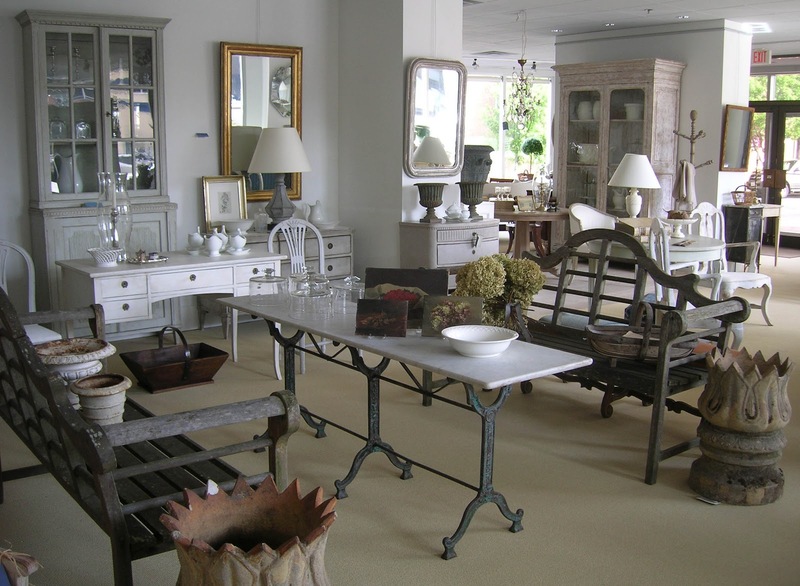 I could buy everything but that tall glazed bookcase and the desk in front of it really caught my eye - delicious! ps photos are fab!! Loi, Your gardens are seriously more exquisite than those Ive seen in Williamsburg and pictures of estates in England, etc.! What an eye you have, and so well planned and executed with artistry! I am so amazed at your talents. I just love Panda! didn't hear of your darling pooch before. Ok, now if I don't get to your store this weekend ( you have me salivating) I will be terribly disappointed. Hopefully Saturday! Loi, my heart just sings!!! Everything is SO beautiful. And Panda is the cutest thing! Your garden is a private jewel box of plant perfection, absolutely stunning! The placement of the trees is perfect! One day you will have to tell us how it all came to be. I am going to share this post with my Arvind this evening so we can analyze it together(both plant lovers). Your shop...well, I love EVERY SINGLE PIECE! Your garden is amazing, but that certainly doesn't surprise me one bit! Are those periwinkles in the urns? I planted some myself. Ok, so Panda is too cute for words, and I don't see her messing up the gorgeous garden, lol. What a shipment. Love the benches and the chimney pots. Wow Loi, this is the perfect garden! Love every detail and it reminds me I have to get my own sundial! And the look on Panda's face, he seems to be saying: Master, I don't quite believe you are serious, you know it's my favourite passtime! And sooo much eye candy in your shop! Why can't there be a shop like this here in Peru? 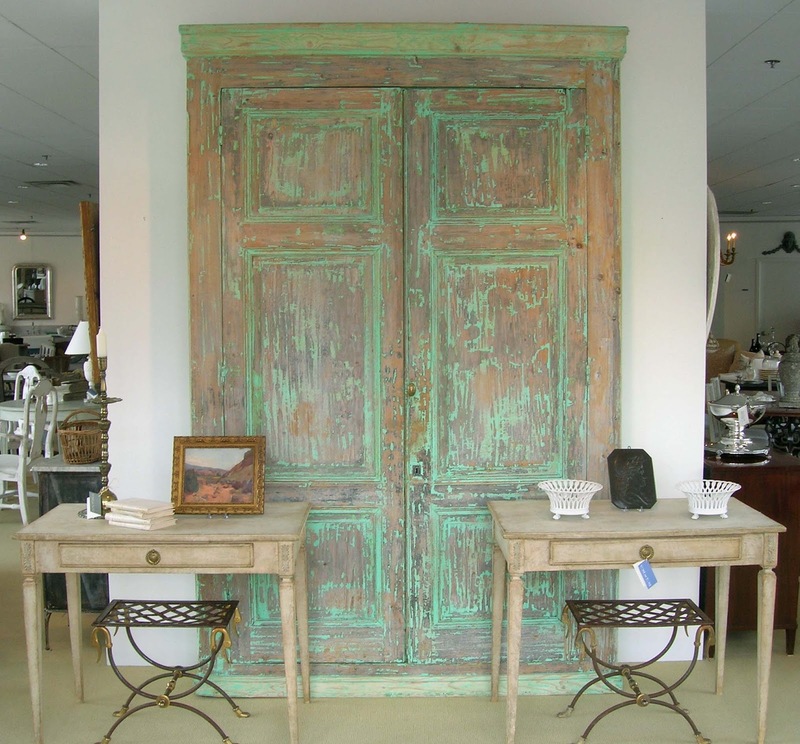 The distressed French cabinet is a dream! Some day you should open its doors and show us the cubbyholes inside. Hi Loi - There is so much beauty in this one post! Your garden is fantastic and the stone doe atop the wall is lovely. I feel more relaxed just looking at the photos (Panda is so adorable!). Loi, how lovely to see you in blog land! I have mentioned your store in the past and I am a huge fan. I used to import Swedish antiques myself and I am sure we know a lot of the same people (I am from Stockholm)! Your garden is wonderful! 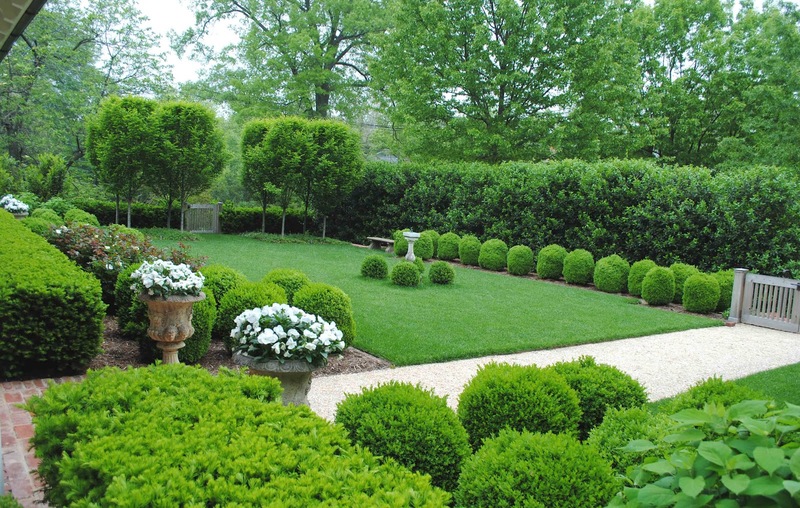 I am also a huge boxwood fan! Warm hugs to you from Seattle. My goodness Loi...your garden is amazing. You are a master gardener for sure as well as talented in so many other areas. That lavender tinged clematis is so lovely. The new inventory is beyond gorgeous...sigh. I think I am in heaven! Well, I guess I wasn't as speechless as I thought...back to picking up branches and pine cones up here at the lake house before I'm caught on the computer again! Loi, your garden is amazing and so is the new shipment. Love coming to your blog and seeing your wonderful photography. Loi, the garden looks splendid. Great design, great layers and textures. 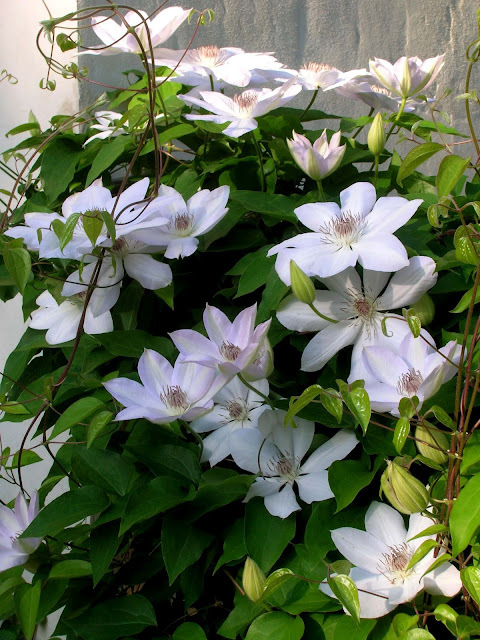 The Lavender hued Clematis is a stunner and a very clever choice in that it turns white to compliment your colour palette. I am super impressed as a pure white Clematis would have just been to easy. I love the fawn who lives on top of the wall. Did you name her Marianne! The shop looks gorgeous, I could save on shipping and just move in! I am in love with your garden!!! Awesome! Oh my!! This is so beautiful! And all the new items you have in the shop! You have a wonderful taste Loi! I love that Luytens bench! Thank you for sharing the images of your garden! They inspired me!! Loi, Your garden looks so lush and it is just the beginning of May! The boxwood look fabulous and I love all the garden ornamentation you have throughout. They add such character and interest to a garden. Thanks for sharing these lovely images. Your garden! Oh my! It's magnificent. I love all of your new beauties for the shop. I'm also a doggie lover....I have two: Mocha wouldn't cooperate for the little photo shoot. Loi, I'm obsessed with your garden since first peek. If I had a garden (other than my containers) it would look more like the Mojave... and not because we live in that climate! And by the way Panda is adorable! He who is the lucky pooch that gets to play there everyday. Thank you for stopping by Ideezine blogspot I appreciate your comments. There really is so much that gets lost in translation when one tries to explain or define a "garden of inspiration" visuals can explain what words miss. I really enjoy these photos of your garden elements, decorations, plants, structures, and scale between the hardsca[es and softcapes. Immense envy for Panda's and Mocha's playground. In a garden as beautiful as yours one can really be at peace with the world and work on future dreams to come. You are indeed equiped for a garden party or art showing, family brunch or just dreaming through the seasons. Your store shipment really holds the keys to some of the goodies in your garden. Where are you hiding your greenhouse/glasshouse?...ha ha your plants are so perfect they look as though they are right out of a greenhouse/glasshouse. I've saved these post photo's on my laptop so I can enjoy a stroll through Loi's, Panda and Mocha's garden for inspiration as I work on my own piece of heaven on earth this spring. I headed over after reading about the blog on Brooke's blog V and L. What a treat for the ol eyes and those gardens.........well, it makes me want to get the Welles on and plant something! Loi, Your garden is beautiful and such an amazing use of space. That is very interesting about your walkway, as you are right- all gravel is very soft and moves and I need to go rake mine;) Adore your sweet little Panda! I understand about the basement... mine is the same! Every photo in this post is beautiful! I love all the furniture shown in your store! I wouldn't mind living in it! Greetings Loi from Paris! I am finally able to access stable internet:) Just so that you know, your gardens rival what I have seen on our trip through Normandy and Guernsey! I very much appreciate your attention to form; and, like the allium... rise up to greet you;) Thanks so much, Brenda. Amazing post:) I thank you for so sweet words on my blog. Its interesting that you have a shop in Sweden, in wich town is it??? ?and Gunnebo is soooo divine, I go there a few times a year. I was looking at your post when my husband came in and tossed me my new Wayside Gardens catalog, seriously. I believe that gorgeous clematis is Claire de Lune. Oh how I wish I could grow it here. Thank you for another beautiful post. Lucky us! Hi, Kerry - Are you on Pinterest? If so, email me so we can chat. I think I'm following you...not sure as I get so many emails from Pinterest. Easily one of the most spectacular gardens I've seen. Absolutely gorgeous garden and store! And Panda and Mocha, too cute! I have about a million questions I'd love to ask but will only bother you with one...In the picture with the reindeer, would you know what the trees are that are in a row along the fence? Can't wait for more posts on your beautiful blog. I knew your garden would be gorgeous! Love your blog!!! Love the desks in front of the green cabinet! I'm enjoying seeing your antiques selection! You very deftly combine items from different countries that all live so happily together. I imagine that some of your customers would like to live in your showroom! So thrilled to have discovered your blog! I am located in Vienna and visit Bethesda quite frequently. I don't know how I have missed your shop but I will most definitely be stopping in. Thank you for all of the beautiful inspiration! Your garden looks extremely impressive! Also, I like your French painted cabinet and the carved limestone flame top finials. How much did its shipment cost you? You must have spent a significant amount for its shipping. I hope your antique shop will continue to sell such wonderful garden antiques and furniture from around the world. Keep it up! Please tell me you trim and shape all the boxwood yourself. I am on a hunt for so much more white now. This is so peaceful and stunning. I love all of it. I just stumbled upon these pictures of your garden, and it is absolutely stunning! I hope the hot, dry summer was not too hard on your beautiful blooms and foliage. I live not too far from you in Southern Maryland. 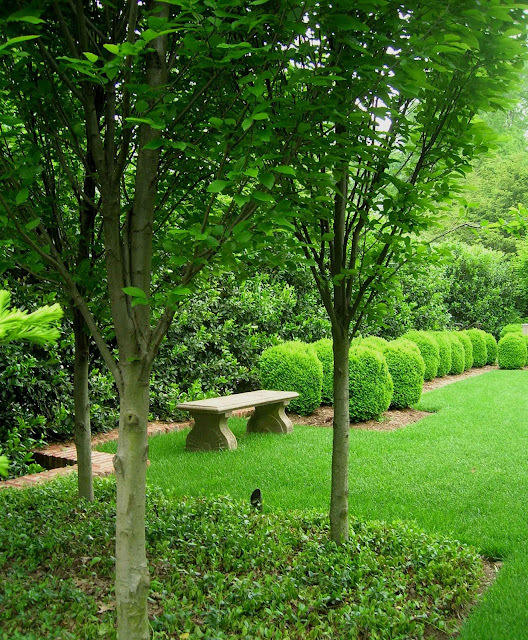 Would you mind sharing the name of your landscape architect? I live in a very fun vintage farmhouse built in 1930, and its 4 acres would benefit tremendously from this kind of talent and vision. If you say you did it yourself, I will die of jealousy!